Hit a home run with the PhotoPog Bag Tag! Three in one, one for your sports bag, one for your water bottle and one for anything else you can imagine. This two sided bag tag can be personalized with the name of Your team, Your name, Your number, and a team picture of logo. Thick solid plastic and over-laminated to ensure longevity, your picture’s printed digitally with personalized information. All bags look alike but identifying your bag with your picture is so easy and your personal information goes on the back side in case of loss. 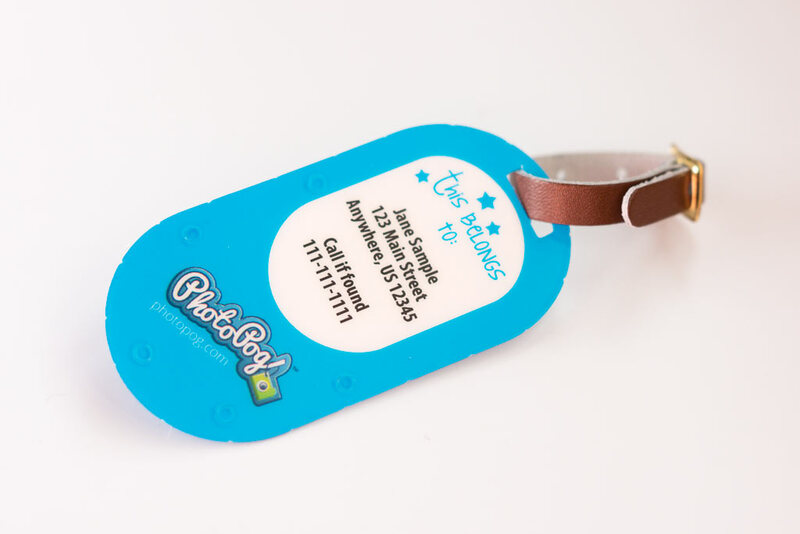 The PhotoPog Bag Tag is the trendy new product that people are using to identify their bags, and show off their pictures at the same time. Used to adorn everything from backpacks to messenger bags to handbags to key chains and more. They’re the perfect way to bring an extra dose of personal style to the accessories that get used on a daily basis. Use the same 3 pictures in your design or choose 3 different ones, more choice, same price. One for your backpack, one for your key chain and one for anything else, they add style to everything. Click the Design online button and get started on your bag tag today.